Whatever your goals and whatever type of shoe you are looking for, it is our mission to make sure that you are in the correct fitting and type of shoe. We start our shoe fitting process with an in depth discussion with you about your footwear needs, goals and concerns. 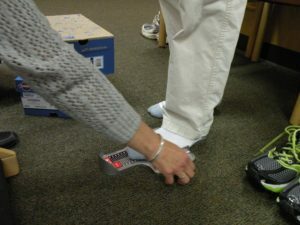 We will measure both of your feet for length and width. A visual inspection of your feet will also be conducted in order to determine your foot and arch type. 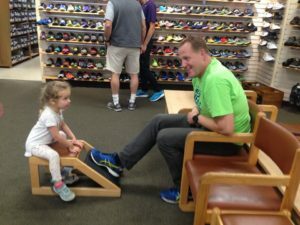 For those customers who are buying shoes for running, we will conduct an analysis of your gait (how your feet react when they come into contact with the ground during a run/walk). Our Video Gait Analysis System, enables us to video tape you while you run on our treadmill. After a short run (around 8 to 10 seconds), we can play back your run in a frame to frame slow motion setting. This allows us to show and explain your running bio mechanics to you. At this point in the process, we are able to start recommending the correct category of shoe for you to try. As we put the shoe on your foot, we can ensure that the shoes you are trying are the correct length and width. 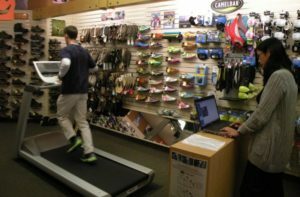 You are then able to walk or run on the shoe either on our treadmill or our in store track. As you try on shoes, if needed, we can re video tape you running and can in slow motion frame by frame playback simultaneously show you your gait in up to 6 different running shoes.